This time we leave the continent to bring some heat over from Australia. 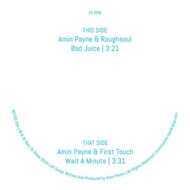 Amin Payne known for his releases on Hot Shot Sounds or Beatgeeks collabed with also Australian based Roughsoul to bring us an synth-driven, bodyshaking Modern Funk bomb called "Bad Juice"
Full of positive vibes grown under Australian's sun. Like always we are very proud to work with these guys to bring you some heat out of cold Germany.